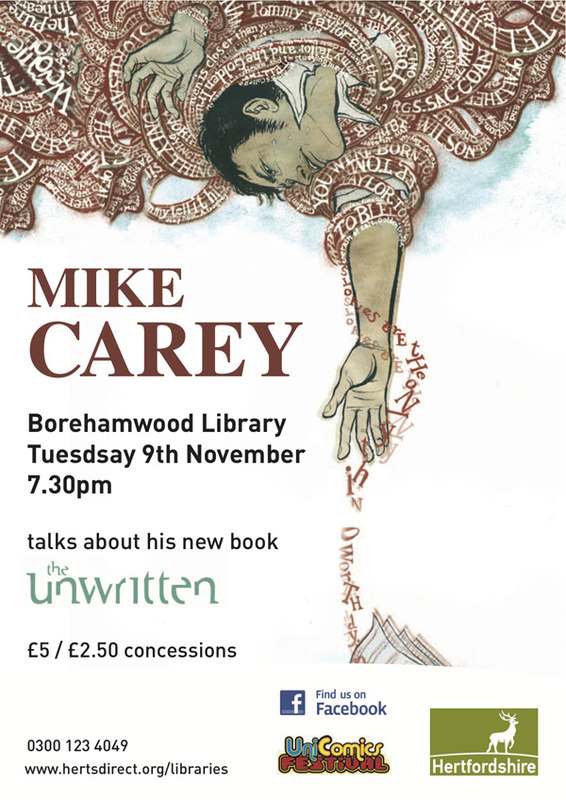 On Tuesday 9th November, as part of the ongoing collaboration between Hertfordshire Library Service and UH’s “UniComics” festival, I will be hosting an event at Borehamwood Library in Hertfordshire where I will be interviewing Comics writer MIKE CAREY about his hit VERTIGO series “THE UNWRITTEN”. Carey follows an illustrious tradition of British comics talents starting their career on famed si-fi Comic 2000AD and then graduating to the American market to ever-greater heights of success. He first came to prominence in the U.S with his excellent work on Lucifer, a spin-off of Neil Gaiman’s hugely-acclaimed Sandman series and a lengthy, 40-issue run on seminal Horror series Hellblazer. He also made a big splash at Marvel with his extensive work on the X-Men franchise. Outiside of comics, Carey is also the creator of the popular Felix Castor mystery novels, of which there are now five volumes, with a sixth to follow next year. The Unwritten, which debuted mid-last year, is an engrossing series which follows the fortunes of Tom Taylor, who was the inspiration for a series of hugely successful children’s fantasy novels in the vein of Harry Potter. The series deals with themes related to fame, celebrity, and the relationship between fiction and human consciousness. It’s a very good read and is a must if you enjoy the similar meta-fiction shenanigans of Bill Willingham’s FABLES. I’m a big admirer of Carey’s work – and The Unwritten is a cracking series – so am very much looking forward to our conversation. Hope to see you there…!